Types of Art: The most common types of objects found are carved masks, which have been stylistically compared to Japanese art. They also carve standing reliquary figures, which watch over the bones of the deceased. 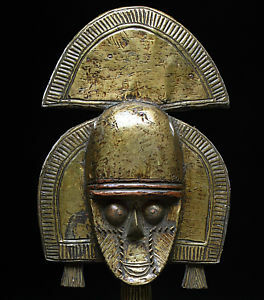 Religion: There is very little known about the Punu religion, but similarly to their neighbors to the north, the Fang and Kota, the Punu carve wooden reliquary figures which are stylistically different, but similarly attached to a basket carrying the bones of individual family ancestors. This seems to indicate a similarity in religious practices in regard to ancestor worship. There is also an abundance of female masks in this area. Several reports from early travelers in this area link those masks to the Mukui society, about which very little is known. Other reports link them to dances celebrating the female ancestors of the Punu peoples.